The design of total simplicity with a touch of 'issued-by-the-army' strikes me dead in an instant. Seriously. Frank Hell. • Small and Lightweight. 8cm - 30gr. I want to carry these microphones with me all the time. I can put them in my pocket while taking a walk (with my Dictaphone in another pocket) and forget I am carrying them. • Ultra Quiet. myNoise microphones do not add noticeable background noise even when used in quiet environments. They are the best performers for their size. Their self-noise is not only low, but is characterized by a spectral density that makes them perceptually quieter than other microphones with the same signal-to-noise performance. • Extended Frequency Response. myNoise generators are produced to cover the whole audible frequency range. Similarly, myNoise microphones are flat across the entire audible range. • Optimised for Headphones There are different ways to record stereophonic sounds. The typical myNoise listener uses headphones. myNoise microphones have been optimized for headphone playback. By simply spacing them 20 cm apart − the average distance between the human ears − you will be able to achieve incredibly immersive soundscapes. • No Side Vents = less wind noise outdoors. • Ultra Low End Our microphones have a tendency to pick up any sound, including sub-sonic sound. People usually love the deep lower end, and their subwoofer too! It isn't much about boosting the low end, but the ability to go really low in the frequency response, and pick up infra-sonic frequencies. You may hate it, or love it. myNoise microphones are delivered as matched pairs: two microphones sharing the same sensitivity, and frequency response. The tightest tolerance and test protocol are used. While sensitivity is often matched at one single frequency − usually 1 kHz − I use the full audible spectrum instead (Pink Noise). Matching frequency responses relies on 30 third-octave band-limited noises. Each pair is delivered with a document produced at matching time, as represented in the picture. 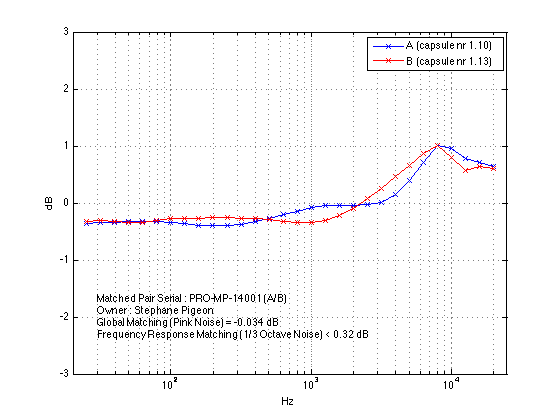 It shows how well the capsules are matched in sensitivity (-0.034 dB) and how they differ in their frequency response (no more than 0.32dB). It also gives information on each microphone’s frequency response (they are flat within a tolerance of +/- 1dB, and exhibit a small bump around 10 kHz, in this case). Each pair behaves slightly differently. If you are interested, I can send the graphs related to the available pairs, so you can pick out your preferred one. Honestly, my tolerances are so tight − 0.25dB in sensitivity and 0.5 dB in frequency response − that it won't make any audible difference. The graphs all look different, mainly because I use a highly magnifying scale on the vertical axis!